Cartoonist drawing tools are discussed here in depth. I recall first trying to use a Hunt’s Crowquill dip pen with Higgins India Ink. Big mistake because my chosen paper was a 25% cotton bond Hammermill brand of business typing paper. The natty surface caused the extremely sharp tipped pen to actually dig into the surface of the paper, even with light pressure applied. It was frustrating to say the least and trying to get a line that was smooth, if not consistent, was out of the question. I struggled for days and tried holding the beveled tip at an angle so as not to dig directly into the sheet but still allow a flow of ink along my pencil lines. 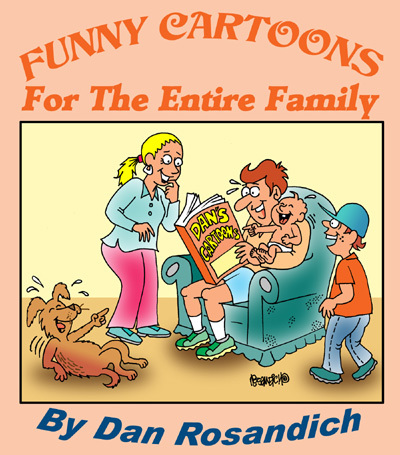 I eventually mastered it enough to create some cartoons over time that I was somewhat satisfied with and submitted to various magazines and newsletters. Some were even resulted in actual sales – I submitted them to Farm Progress Magazine, Crops & Soils Magazine and several other very “off the radar” type publications which were actually a good training ground. I eventually said goodbye to the crowquill, realizing it wasn’t going to be a part of my weaponry or repertoire . . . just that I wanted to try it because another cartoonist whose work I appreciated (R. Crumb) obviously used the same instrument for many of his early Zap comics characters. When you are starting out and experimenting, it’s worth a try. I graduated to Globe Bowls which are similar to Crowquills….they’re tips you manually dip in an inkwell and a small reservoir holds a minutia of the precious black liquid but of course is no where near as sharp of a tip but again, I used it and experimented with alot of drawings only to grow disillusioned with it. Along came the Speedball B-6 which is yet another manual dipper although I found the device to be a physically superior drawing instrument….at least for my own self….that withstood alot of pressure, bending and prodding and you could let some clogging occur between the slit up the middle of the tip but had to occasionally clean the small brass sliver that lies atop the main dipping shaft. 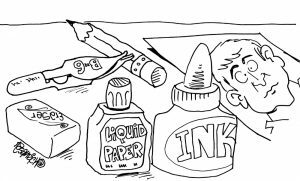 If you didn’t, the “flow” of ink would be interrupted to the point of resulting in over-splatter after dipping and bringing the tip over and onto the sheet and starting to work on your pencil lines. To follow are recent conversations from different cartoonists on their ideas in regards to drawing tools and some in depth view points on incorporating the use of digital technology into producing cartoons……. I sketch/draw with 2b or 3b pencils. I like how soft they are, yet still keep a point if I want one. I have Never in my professional career inked on bristol…kinda sad. I scan my sketch, or copy it, and ghost it down so the lines are quite faint, and ink on vellum, over top. I can still see the faint outline, which I sort of follow, but it keeps me lose. I also sometimes just sit down with paper and draw the thing out in a felt tip pen on color copier paper. Just make corrections digitally. I like to work lose and quick so from this perspective, my cartoonist drawing tools remain basic. When working with paper, I start with mechanical pencils. My favorite being 0.7mm HB. For inking I have an array of Sharpies. When the ink stops, they go straight to the trash. When on the road, I carry a WACOM tablet and sketch digitally with GIMP. If I draw on a napkin, I’ll save it and scan the image into my laptop using a hand wand scanner, then go to town using the WACOM tablet. I still have my Speedballs and fine quills, but I only use them for expensive paper and “keepers” that I want to put on display. I have found that some customers do not like the Sharpie cartoons as it looks like they were photocopied. Sheesh…I’ve actually taken the time to add some white out and India Ink to the Sharpie originals so that the customer feels like they got an original image. Which reminds me, I had a college art instructor who made dozens of prefab paintings of a popular sidewalk scene. He had them stashed into a bag. Then he’d pull one out, set it on the easel and start adding fine details. A passerby would stop and say, “Hey, how much for the painting?” He’d sell it cheap. When the “tourist” moved on, he’d pull out another same painting and start adding minute details, repeating the cycle. He said it helped pay his way through college. Hmmmm…maybe I should try this with some photo copies adding India Ink or whiteout for fine details. As long as they see the ink drying, it looks like an original. Who says you can’t learn something from art school? I really like Micron 08 pens, but I find that they dry out quickly on me. They don’t dry out completely, and they are a bit expensive, so I have a whole case of Micron 08 pens that make a kind of greyish line that I will never use, but can’t bear to throw away. I wish there was some way to salvage what little ink is left in them. You bring up a great question with regard to how some of the great comic strip cartoonists might have reacted to digital creation had they been around to see it! I picture Schulz bristling against digital art. A true artist like Al Capp might have as well. Though with most Disney & Pixar-trained artists and animators today using Cintiqs, I think someone like Walt Kelly, (who came from Disney to comics), might have been using one all along. Scott Adams is someone who I feel has a different view of cartooning…as he puts it, he is not a traditionally trained artist — and his real strength is as a writer. I was a little surprised because a good percentage of professional illustrators, commercial cartoonists and animators that I know or talk with draw digitally. The fact that many print cartoonists are still drawing on paper is interesting…and I completely understand the thinking. For one, if it works well, why change it? There are other reasons, too…such as the secondary market for original art. That mainly applies to well-known creators with a great following, but for them, it is reason enough. Having been a political cartoonist, I can offer another reason unique to that profession. Certainly you can email images or put them on social media…but the reaction is not as immediate and the comments not as trusted as those from people whose opinions you’ve learned to trust. For the rest of us who cartoon for fun or as a profession, the reasons for using specific tools is just as personal as it has always been. I can recall how some cartoonists swore by particular pen nibs…or others who refused to try a dip pen but love using a brush, or chose Sharpies over pigment pens…the same went for the use of Graphix shading boards and Benday/Zipatone screens. (Certainly I’m showing my age mentioning Paleozoic era terms like those). And now that I think about it, the list of options most people use has actually narrowed in recent years as much as the technology has advanced. To me, the reasons for trying digital drawing are personal also…but the main one is to address what has become a large volume of output. If I were still working for a newspaper or a syndicate, drawing just 7 cartoons a week, (When you’re writing 3-4 ideas for every strip you draw, it’s still a lot of work! ), I would probably still be using traditional tools. But with large corporate projects or book illustration jobs, it helps tremendously. I can create twice as much artwork in the same time it once took me to draw it on paper. It also helps with the process of making revisions for book illustration or even advertising illustration. It’s all about getting the best results and doing so with tools and an environment that makes you feel comfortable…and one thing has not changed over the years: for each person that is a unique and different formula. I find a disconnect with a digital pen. Not one of my favorite cartoonist drawing tools. I use Strathmore Bristol vellum 2ply along with Arches 90 lb watercolor paper. Also Cotman watercolors. I have nibs but prefer Pelikin fountain pens with F&W inks, Higgins or whatever I find. And yes I have a huge pile of originals. I also scan and send finished art. There’s been a few times when clients have lost digital files or can’t open them. I resend them and if not I send originals which always get returned. I like to keep it simple -I guess I’m a bit of a dinosaur, but it works for me! I’ve been 100% digital for about three years now. I use my digitizer when I’m at home and my Ipad when I’m out and about. Who assumed years agao, that a “digitizer” would be considered one of the cartoonist drawing tools?! I like to use Manga Studio, and Photoshop at home and Procreate on my Ipad. When I’m not in a position to use digital tools I like to draw with a nice dull pencil almost all the way down to the wood and I love drawing on copy paper as well. For inking I like the disposable Micron pens. I’m essentially digital for all print media these days. I use a cintiq and it’s increased my productivity by about 30%. I still use traditional tools but generally only when I’m doing public events like caricatures or murals. I’m still using pencils for roughs 2H-HB. I scan them and trace them in layers using photoshop, illustrator or manga studio. For this, I use the cintiq. I still love pens and brushes though. 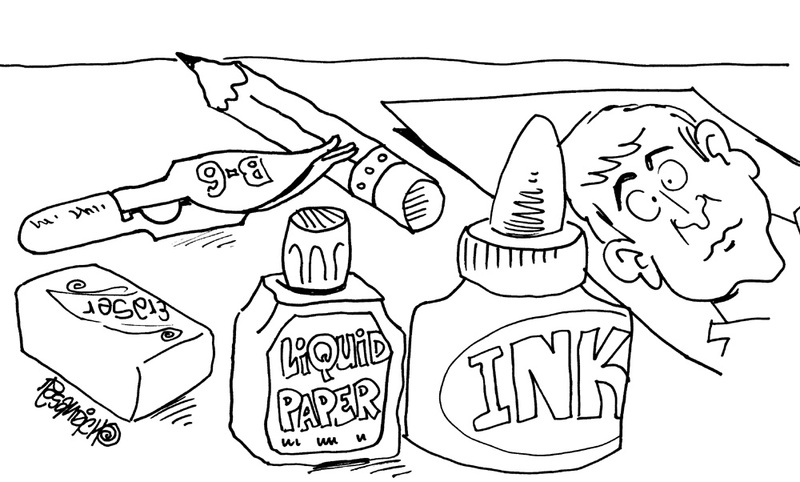 these are some of the best cartoonist drawing tools. For sketchbooks and napkin art! I like the HiTec C pens. You can get a really fine point with them. I have used rapidographs in the past but these pens are just so handy. Fun to draw with. I used to like the Zeb rollers too but they are hard to find these days. I liked them for a thinker line(.7). It’s a nice consistent line and a lovely smooth flow. My favourite pens now are my brush pens. These are great cartoonist drawing tools. I’ve tried many different brands but it finally comes down to the Staedtler mars graphic 3000 duo. It has the closest nib to my Windsor Newton Series 7 brushes. The line variation is beautiful. The best I’ve ever tried. The only negative is that I go through them really quickly. Its black line doesn’t stay dark long enough. I went through 3 boxes of pens over a 11 day Calgary Stampede event. For window painting, I like the Pilot Jumbo marker with refillable ink. Great, as one of many types of cartoonist drawing tools! A nice broad line, and dark black ink. I’m trying some graffiti pens but nothing better than the Pilot just yet. It’s evident that there are a wide range of drawing tools available for cartoonists that range from the traditional to the technical (including digital tablets, using a stylus etc.) and the real deciding factor is up to the cartoonist….by actually experimenting. I’ve experimented using camel hair brushes which also provided an excellent line, however you can now achieve that same look with a stylus and digital drawing tablet tool strip settings and adjustments. For my own personal taste and for ease of creating cartoons, I’ve chosen the Rapidograph as one of my favorite drawing implements along with a standard Sharpie marker. The tools you decide upon can be endless….just experiment to find what device best fits your drawing style! More types of cartoonist drawing tools will be discussed in the future as technology progresses.